Halloween for the little ones can be more than adorable costumes and dizzying piles of candy. It can also be a learning opportunity with spooky stories to encourage reading, simple puzzles to exercise little growing brains, and a healthy pinch of Disney magic. 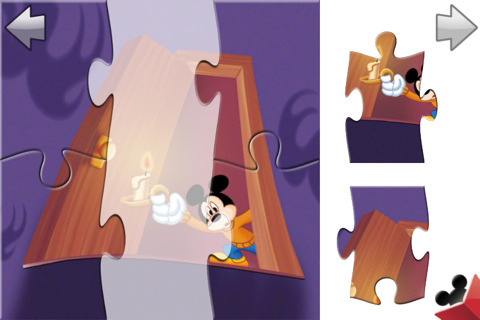 Mickey’s Spooky Night Puzzle Book is a bit of a mouthful, but the app is a lot simpler than the title. An interactive book designed for little ones, it takes you on a Halloween adventure with Mickey and Friends. Mickey is throwing a Halloween party and all of his friends are invited, but he must first venture up into his spooky attic to find his Halloween costume. The story is predictably gentle Disney fun, unlikely to give even the littlest readers nightmares. This is a fully illustrated picture book with the fantastic visuals you’d expect from Disney, and the friendly narrator does a swell job to bring the story to life, so even kids who can’t read can follow along and enjoy. Of course, Mickey chimes in to read his own dialogue. To progress or back up in the story, there are easy to use navigation arrows at the top, and along the way are two basic interactive elements: hidden ghosts sprinkled throughout, and simple 9 piece jigsaw puzzles that come every other page or so. The ghosts aren’t very hidden and wiggle a bit to call attention to themselves. You can tap on them to collect them all, and at the end of the story is a simple matching puzzle involving the collected ghosts and their shadows. The jigsaw puzzles are just the picture on the page broken up into a simple puzzle. The pieces lock together when they’re roughly in the right place, which makes it easier for developing motor skills. It’s a very short story, but the built-in narrator means that if your little ones feel like hearing the story again and again, you don’t have to be the one reading it for a change. You can always turn the narrator off if you prefer, and there’s a really nifty extra that allows to record yourself reading the book aloud, so your kids can have your voice reading to them over and over on demand instead. This is definitely a book, not a movie, with no moving pictures (aside from the occasional ghost wiggle), and the text is always right there on the screen. This isn’t a teaching tool though, so don’t expect too many extras. The text does not light up along with the narration for kids to follow along easily, and there’s no real lesson in the story aside from a minor one about being brave and facing your fears. Bottom line: This universal app for iPhone and iPad features a cute and light “spooky” story with familiar characters, but it will only really keep the attention of the littlest Halloween goblins and ghouls. 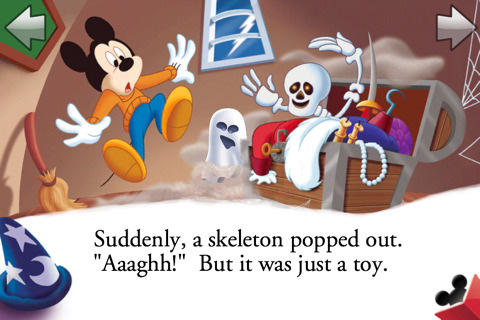 AppSafari review of Mickey’s Spooky Night Puzzle Book was written by Tracy Yonemoto on October 29th, 2010 and categorized under App Store, Books, Education, Games, iPad apps, Mini Games, Puzzler, Universal. Page viewed 4143 times, 1 so far today. Need help on using these apps? Please read the Help Page.